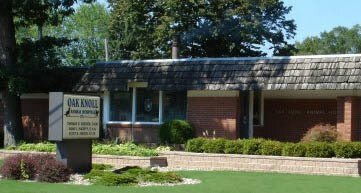 At Oak Knoll Animal Hospital, we believe that we can improve the overall lives of our clients and patients. We believe that we can extend the health and well being of your furry family members. We are devoted to providing compassionate care and guidance for pet parents. We are guided by our core values of family, service excellence, guidance, devotion and compassion. What does this mean for you? As a client, your family is our family. We consider our clients an extension of our family, and we strive to treat you as such. We want to be the best! Service Excellence means we will challenge ourselves to provide the best patient care and the best client service. To us, veterinary care also continues outside our doors. You need to know how to care for your new kitten, or your senior dog that just had surgery. Let us be your trusted guides! Our team is devoted to serving you - we're here because we want to be. We feel lucky to have a team of caring and empathetic pet lovers! To extend and improve the lives of companion animals through exceptional comprehensive medical care and to serve our client with compassion. We are devoted to sharing knowledge, building family, and creating a sense of community. We are currently hiring and accepting applications! You can complete an application form by clicking the button below. You may also print and then fax, email, mail or drop your application and/or resume off at our office.